Deb's Cup of Tea: It's a puzzle! I have found a couple of game sites on the web I frequent where there's a lull at work. Tweeler and Big Fish Games have games in both PC and Mac format. Games have a free play mode as well as the ability to download a trial. Tweeler games free trial can be as long as 80 minutes, while Big Fish's trial is an hour. The graphics are excellent and, at $6.99 for 90% of their games, you can't really go wrong. The best part is that if you find a game you like, it sometimes is on sale at Big Fish for $2.99 as they have daily specials. I'm partial to the time management games, where you have to accomplish so much in a given time, or the puzzle games where you move a certain number of pieces in a given time. I also like the find object games but can be frustrated when you are out of hints and can't find an object. This impedes your progress through the levels. I like the puzzle within a puzzle game where I can earn additional hints by doing other puzzles. We were walking through the museum and reached the section about modern farming. One of the ways the museum heightens the experience is by making the floors, walls and ceilings part of the exhibit. Witness the carpet in the farm section. 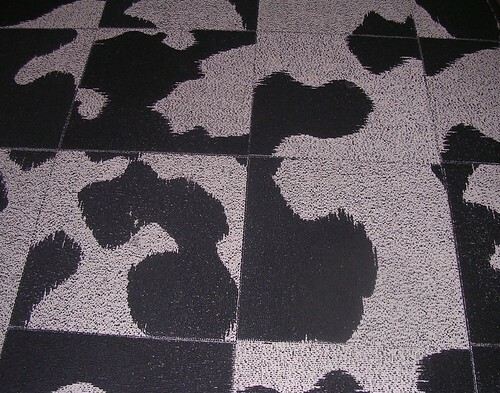 Not only did I laugh at the 'holstein-ness' of the carpet but the pattern reminded me of a game where you have to align the squares to one another to create the ultimate picture. So, if I rotate this square one turn to the right and this square one turn to the left, the one below this one has to go to the left while this square has to go to the right. No, that's not right. Let's turn this square 3 times left and this one twice right. You folks just go on. I'll be here awhile.